Our favorite holiday deserves a whole month! We've been plotting and planning and have all kinds of tricks up our sleeves for the next few weeks. 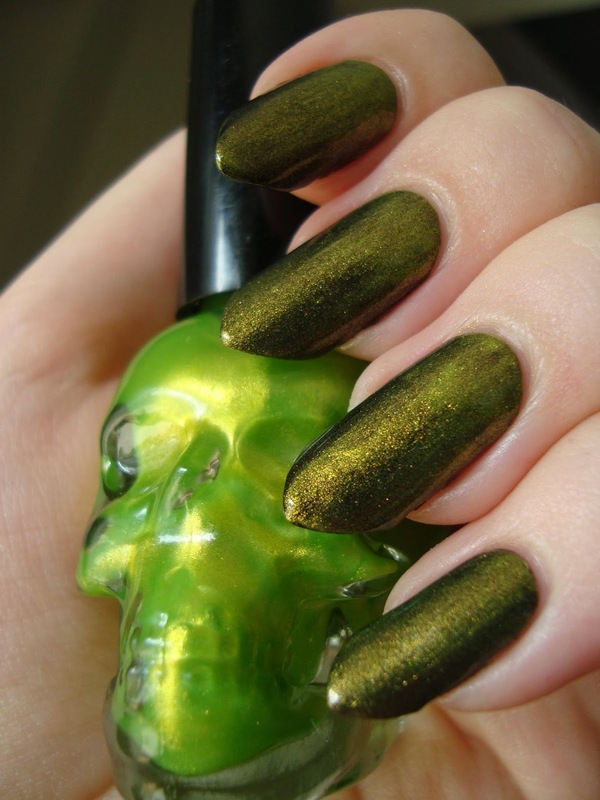 Polishes old and new, makeup, giveaways...completely overboard is the only way to go when it comes to Halloween! I've mentioned FingerPaints Black Expressionism many times, but never shown it all on its own on the blog before. No better time, right? It's the best black cream I've tried...and I've tried many. 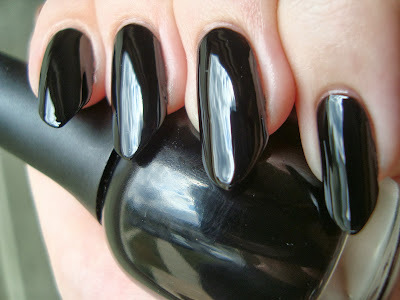 Glossy, easy to apply, rich, deep, and perfect in two coats. Nothing I've found compares. It's a polish everyone should have. Black Expressionism is a staple, but novelty's fun sometimes too. I usually haaaate novelty polish bottles. They're generally awkward to use, especially if the cap is part of the novelty shape. 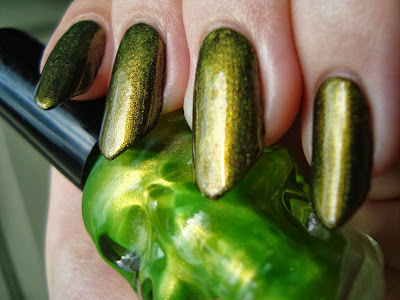 Still, skulls always draw me in and when I saw skull polish bottles at Target's Dollar Spot, I didn't hesitate. Maybe I should have. If you've been looking for skull bottles to franken in (or just to have), these are the least expensive ones I've seen. They're only $1 instead of 3/$5 at Five Below or 2/$8 at Hot Topic. If you go looking for these at Target, they're in the Dollar Spot up front. They're packaged on a card so they can hang on a peg. The Dollar Spot is different at each Target, but they should be with the other bargain costume and decor stuff. There's a pink version too...and I think I remember an orange also. My guess is they're probably craptacular too. The polish may be no good, but it sure looks great layered! Love the final mani. lol You can't see the streaks or smell the stink! I agree. That looks amazing layered!